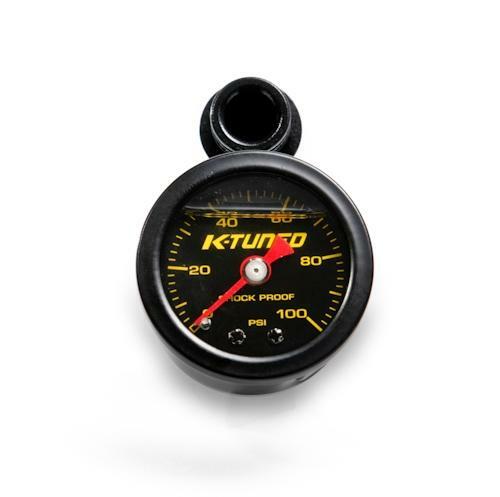 K-Tuned Fuel Pressure Gauge - Lightning Motorsports - Selling Speed since 1996 ! Marshall Instruments makes the most reliable fuel gauge in the industry. That is why we contacted them to make us an all black gauge with K-Tuned logo on the bezel. The Marshall Liquid Filled Shock Proof gauge accurately reads 0 – 100 psi of fuel pressure. The gauges are liquid filled to keep the needle firmly in place while the engine is running. Unlike cheap gauges where the needle is constantly boucing around. They are also shock proof so they won’t fail due to the vibration and constant movement of the engine. Simply put, these are the best fuel gauges available. 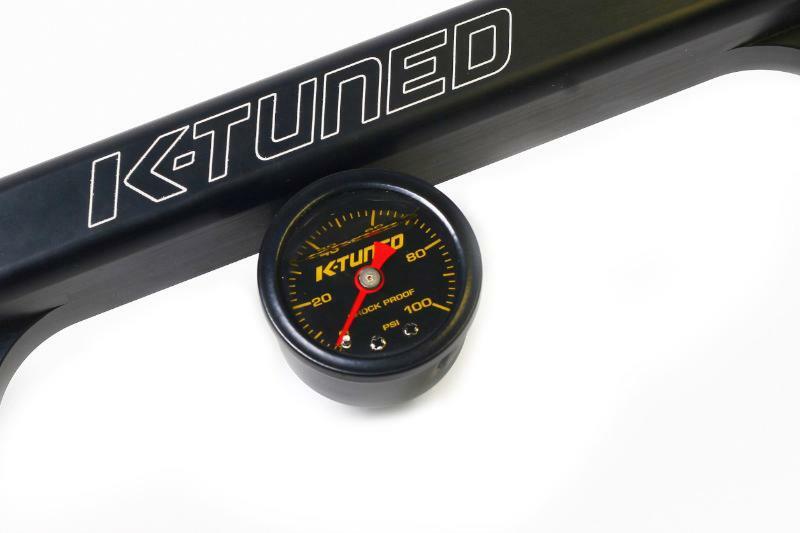 K-Tuned has designed a two piece fitting that uses the existing center port on our rail to properly mount the fuel gauge in the center of our rail just below the K-Tuned logo. The resulting look is very clean, compact and is very easy to install. The fitting is soft mounted on the underside of the rail with o-rings, to eliminate the possibility of dangerous fuel leaks caused by the vibration of the engine unlike other rails where the gauge is hard mounted.